Boiledbeans » Fold in half. Make a triangle. Fold again. Fold in half. Make a triangle. Fold again. 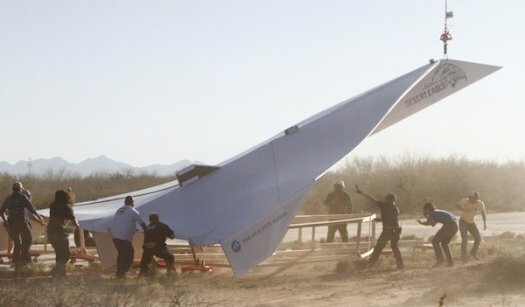 The Desert Eagle – 45 feet long paper plane. Looks like a big paper airplane. World’s biggest? “The “Desert Eagle”, an enormous 45 feet long ( 13 meters long and 7 meters wide) paper airplane by the Pima Air & Space Museum.” in the Nevada desert. Desert Eagle. One huge badass paper plane. Desert Eagle, probably the largest paper plane to have flown. Paper Plane flying in the Arizona desert. only it is super massive. Arturo Desert Eagle, the largest paper plane. World’s largest Paper plane built by a team of engineers led by some Art Thompson.